On Friday, 11/18/13 I was asked to give a brief presentation at my business network on habitat gardening for attracting hummingbirds. There was not enough time to express everything I would have liked to, and this post will share more hummingbird gardening insights. Thanks, always, to Brian Seeley for his technical support, consistency and on Friday, his circuit bending genius. 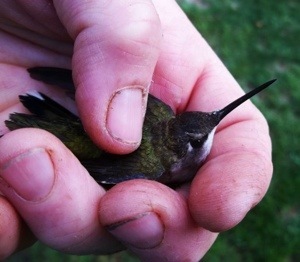 The photo at the top of the page is of my friend Dawn Foglia holding a hummingbird that had been temporarily stunned after release from her strawberry garden nets. This is not an outlier experience; Dawn has frequent contact with hummingbirds (and lots of other wildlife), and it’s no coincidence. Her property has rich biodiversity, many, many different species of native plants are in her copious garden beds. Hummingbirds need nectar, especially in tubular flowers, a constant bloom sucession to have food available, and different textures of plants. 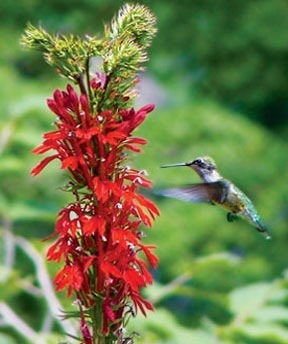 Cardinal Lobelia (Lobelia cardinalis) is an easy to grow native perennial, classic hummingbird nectar filled flower. The Ruby-Throated Hummingbird spends spring and summer in New England; they find our habitat delightful, balmy and temperate for breeding. 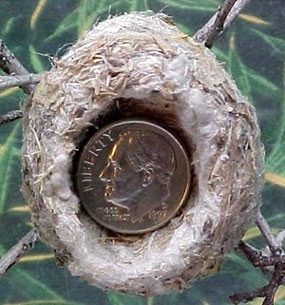 [a naturalized non-invasive non-native] around as hummingbirds use the soft foliar tissue in nest building. Frequently when the hummingbirds return to our region in the fairer months, they find a Wal-Mart superstore or a Starbucks where they had lived and procreated in years past. If they (and all the other wildlife, even ourselves) are to survive, we property owners must provide hummingbird garden habitat. The native plants that compose a wildlife garden like this are astonishing. Besides being low maintenance, never needing fertilizers or irrigation once established, they are the base of our food web. We have a physical link to these organisms. 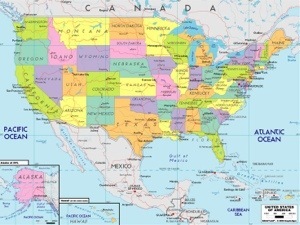 The Ruby-Throated Hummingbird makes the anual migration loop from our perch in eastern New York state to Mexico, traveling thousands of miles, with 600 of those miles in motion straight over the ocean water of the Gulf of Mexico. It is critical that the speedy cuties can find enough nectar and insects to carbo-load as they prepare to leave our region in autumn. (This answers the question all of us have wondered at some point: “Why do mosquitoes exist?” Answer: “To be eaten by hungry birds.” Hummingbirds eat double their body weight in insects every single day, and they can fly 50 mph. 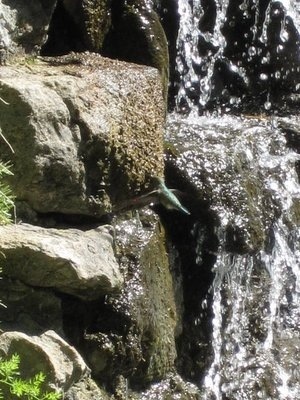 Where the Ruby-Throated Hummingbirds live in Mexico or Costa Rica, there are lots of natural waterfalls. The birds love this, and if we set up a hose to spray out at the mist setting, we can watch the hummingbirds fly right through it. 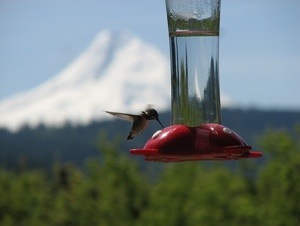 Most people are familiar with simple sugar and water solution hummingbird feeders in the garden. It is important to change them weekly to prevent bacterial build-up which can make birds sick, and not to use artificial red dyes. 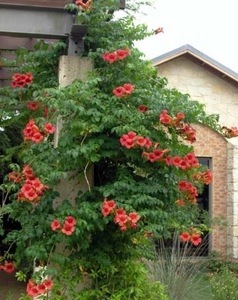 Trumpet Vine or Campsis sp.. Shown in the above photo, attracts hummingbirds to the garden like a magnet. Foxglove or Digitalis. Native sp. is best. Bleeding Heart or Dicentra spectabilis. For the shade garden. Wild Columbine or Aquilegia formosa. *Excellent choice, shade tolerant. Summersweet, Clethra Ruby-Spice or Clethra alnifolia. A shrub, also beloved by many butterfly species. Native Honeysuckle or Lonicera sempervirens. Be sure to pick a native variety, as the Asian honeysuckles are very invasive and wreaking havoc on our natural habitat. Cardinalflower or Lobelia cardinalis. Delightful, tolerates shade and excess moisture. Butterflyweed or Asclepias tuberosa. Also a Monarch host plant. Sage herb or Salvia officinalis, and all other Salvias. 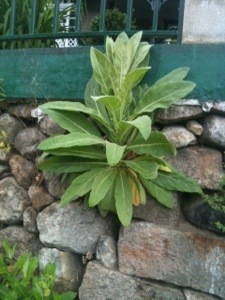 Sage herb has soft foliage, like Mullein (Verbascum) and can be used for hummingbird nest building. Red Hot Poker or Kniphofia uvaria. Native to southern Africa, grow as clumping bulbs that flower in late August here. Flowering Tobacco or Nicotiana alata. Tubular flowers hummingbirds can’t resist. Ornamental Millet or Pennisetum glaucum. Nasturtium or Trapaelum majus. Also a favorite in the vegetable garden: a spectacular companion plant, work horse in staving off chewing pest insects while attracting beneficial ones. Posesses edible leaves for human consumption that have a peppery flavor. Thanks to Ellen Sousa for informational support. 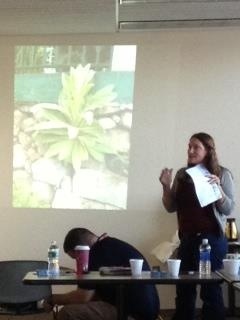 I hope to continue learning from other habitat gardening pioneers, more and more insight about hummingbird gardening.